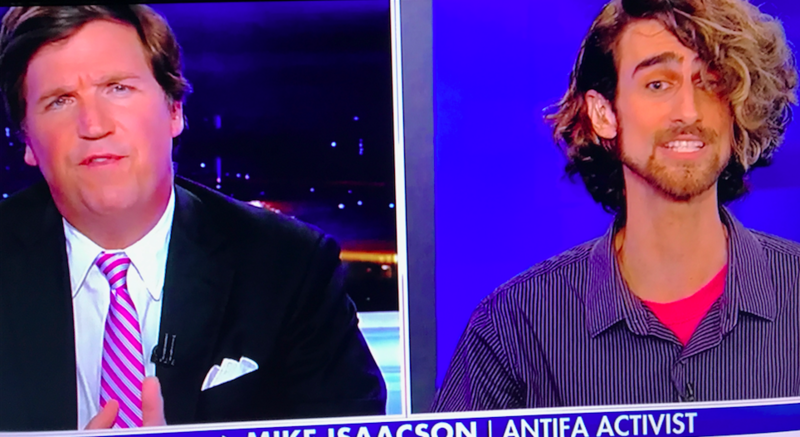 Antifa activist Mike Isaacson appeared on Fox News’ “Tucker Carlson Tonight” Thursday night. As he was getting butchered by host Tucker Carlson, I couldn’t help but notice his uncivilized 70s hairdo. Isaacson is one of the creators of Smash Racism D.C., an antifa organization in Washington. He’s also a professor at the John Jay College of Criminal Justice. And then started laughing hysterically. “Ahhh congressman!” he said, repeating himself and laughing at the preposterous idea that this guy could be a member of Congress. “Professor, thanks for coming on!” Carlson exclaimed.